Jainism is an Indian religion followed by several millions of people in India and by a sizeable number of migrant Jains in Europe, East Africa and North America. The name Jain is derived from a word in the ancient Indian language of Sanskrit Jina meaning ‘victor’ over the passions and the self. Jains aspire to be ‘spiritual victors’ and reverse twenty-four past ‘enlightened ones’, known as tirthankaras, who show the way to spiritual liberation. The originof Jainism remains untraceable. 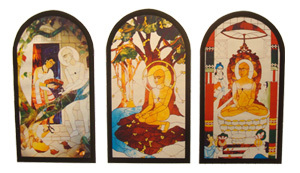 Jains believe time rotates in a cosmic cycle, descending and ascending. In each half of the cycle twenty-four tirthankarasestablish the fourfold order (sangha) consisting of monks, nuns, laymen and laywomen; and revive the teachings of previous tirthankaras. The first tirthanakrasin this descending cycle was Rishabhdeva, who is traditionally believed to have lived thousands of centuries ago, the twenty third was Parsvanatha (c.870 BCE to 770 BCE) and twenty-fourth (and last) was VardhamanaMahavira who lived from 599 to 527 BCE. It is worth noting that both Mahavira and Buddha were contemporaries (Mahavira 30 years older than Buddha) and their parents were the followers of Parsvanatha. The Jain texts describe that the universe and its constituents are eternal. They are working by their inherent laws and are not created by any ‘Supreme Being’. The universe having two parts: occupied and unoccupied. The occupied universe is further divided into upper world, middle world and lower world and is made of living and non-living entities (‘Realities’). All except the matter are formless. The soul is the living being (jiva) and the others are non-living substances (ajiva). The medium of motion and the medium of rest help the soul in its activities and rest. Both jivaand ajivaare interdependent; may change their form, but are everlasting. It is the attachment of non-living substance (karma) to the soul that causes clouding of its characteristics and apparent injustice of life, an unending cycle of birth, death and rebirth in any destiny: heavenly, animal and plants or infernal. The celestial beings live in the ‘upper world’ of the occupied universe. Humans,animals,plants, astral bodies and lower kind of heavenly beings occupy the ‘middle world’; the infernal beings live in lower world. Jains have built beautiful temples; thousands in India, some in Europe, USA, East Africa and Far East. Jain temples, some of which are virtual ‘temple cities’, are among the most beautiful buildings ever constructed. Jain temples are known for their sheer beauty, cleanliness and devotional ambience. The first Jain temple in the world, which brings together in one building all the main sects of Jains, is in Leicester UK. This magnificent building has been created in tradition Jain style, with rich interior stone carvings and a striking marble frontage, and is a major tourist attraction, which welcomes visitors. In recent years many beautiful temples have been constructed in North America and Europe. Jains have also built Upashrayas, the places for meditations and temporary accommodation for the ascetics. Their temple rituals are devotional, colorful and musical in nature; the rituals may be individual or collective. They worship a Jina as an exemplary figure to follow, not asking for favors; the worship is daily, The Jain contribution to the Indian heritage, art, architecture, philosophy and thought is outstanding. Practically all Jains will start the day with a reception of ‘Navkar Mantra’, a forgiveness prayer and a prayer for bliss for all. and pluralistic viewpoint in their thinking. All living beings are my friends; I have malice towards none. May everyone be healthy, peaceful, and blissful everywhere. Jains observe many sacred days as festivals, which are mostly spiritual in nature. The main among them are the Paryushana in late August or early September, Mahavira’s birth day in April, Mahavira’s death anniversary as Diwali in November, and ‘ayambiloli’; in April and October as a nine day period of semi-fasting with blane food. The Paryushana is an annual period of atonement and repentance for the acts of the previous year, and of austerities to help shed accumulated karma. Svetambara observe by listening to the ‘Kalpa Sutra'(sacred text), taking positive steps to ensure the living beings are not killed, showing amity to fellow Jains, forgiveness to all, austerity, and visiting neighbouring temples/upashrayas. On the final day (samvatsari) Jains seek forgiveness from all for any harm, which have caused and forgive those who have harmed them saying ‘micchamidukkaddam’. Digamabaras observe Paryushana for 10 days, each day devoted to the basic teachings of Jainism: forgiveness, humility, straight-forwardness, contentment, truth, self-restraint, penance, renunciation, non-attachment and control of sense. paryushana are concluded with a community dinner. Reference: “Dr. Natubhai Shah”, Jainism.